Electric Knife Sharpener VS Manual Sharpener: Which One to Buy? Knives are certainly an integral part of the kitchen but what do you do when they lose their sharpness? Do you just discard them and end up purchasing the new knives? Well, we have a solution to this problem and this will help you in saving the cos that you incur in purchasing new knives. So, what you can do is that you can get a knife sharpener for your home which will help you in removing the material from the blunt knife and making it sharp again. This is right, you can get back your sharp knife without spending anything extra if you have a knife sharpener at home. Now, one thing that you need to note is that there are two types of knife sharpener available in the market. One of them is the manual sharpener while the other one is electric sharpener. 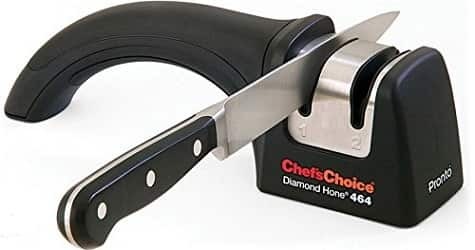 There are again many variations available in these two types of a knife sharpener and in this article, we have listed all the information about the knife sharpeners which will eventually help you in deciding which one to opt for. So, here are more details. Manual Knife Sharpeners remains to be one of the most popular choices for the people who are looking for a knife sharpener. There are many advantages of the manual knife sharpener over the electric one and the most considered advantage is the price of these sharpeners. 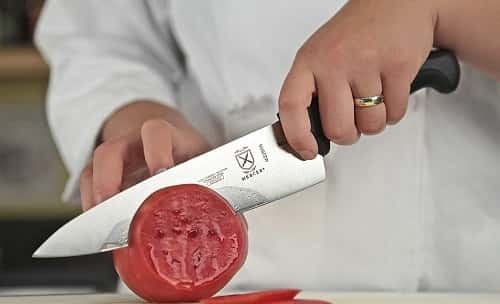 Most of the knives can be sharpened using a manual knife sharpener but you may end up running a knife if you try and sharpen a serrated knife or a knife with waved edges with help of a manual knife sharpener. Also. You need to put in some efforts and force if you are using the manual knife sharpener. So, let us look at advantages as well as disadvantages of manual knife sharpener in detail. These type of sharpener offers a much higher control to you when you are trying to sharpen the knife. The higher degree of control helps you in getting the desired sharpness and it is certainly a must-have feature. Talking about the price, the manual knife sharpeners are much cheaper than the electric knife sharpener. You can certainly go ahead and purchase the manual ones to save the cost. Moreover, if you have limited usage then you can opt for the manual knife sharpener. 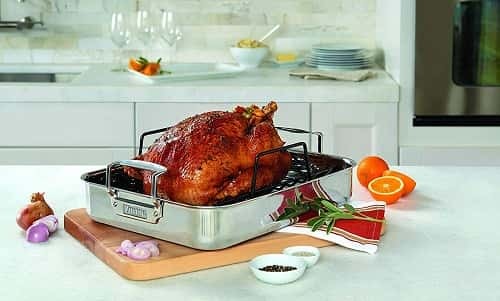 They are most suited for home kitchens as the usage is restricted. For the commercial kitchens, the process can be time-consuming so if you wish to get a knife sharpener for your home then you can certainly go ahead and invest in a manual knife sharpener. Apart from the advantages listed above, manual knife sharpener is safe to use and there are no chances of injury or any sort of damage. You can surely go ahead and purchase the manual knife sharpener if you are concerned about the safety. Talking about the serrated knives, you can’t use a manual knife sharpener with them. Apart from this, you can’t sharpen the waved knives with manual knife sharpener as well. The effort required and the time required to sharpen a knife is certainly much more when you compare them with the electric counterparts. This is certainly one point that you need to consider while buying a manual knife sharpener. This was all about the manual knife sharpener and we are now going to talk about the electric knife sharpener. This will help you in deciding which knife sharpener is best suited for you. So, here are more details about the Electric Knife Sharpener. 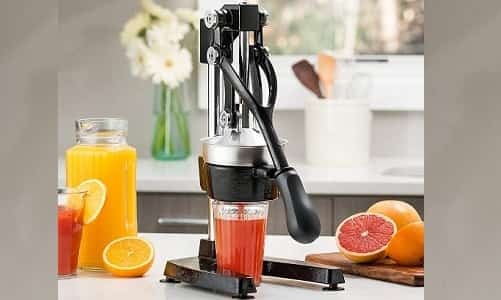 These types of knife sharpeners come with a motor fitted inside the assembly which rotates the sharpener head and in turn, it sharpens the knife easily. They are easy to use and they offer a faster solution to the problem but the cost is one thing that you really need to consider before you buy an electric knife sharpener. Also, if you are using the electric knife sharpener then all you need to do is that you need to simply pass on the blade from the electric knife sharpener a couple of times and your job is done. Let us look at the advantages and disadvantages of electric knife sharpener so as to build a case for electric knife sharpeners. Here are the details. 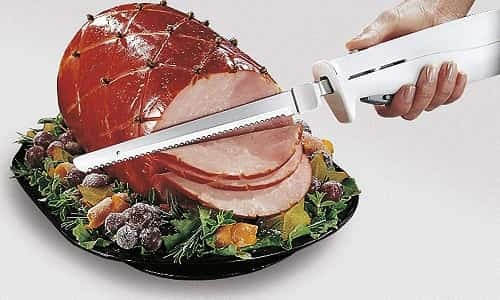 Electric Knife Sharpeners really speed up the process for you and it makes it easy to sharpen the knife in nick of time. The time difference, when compared with the manual knife sharpener, is huge. The finished result of the Electric Knife Sharpeners is quite amazing when compared to the Manual Knife Sharpeners. The speed of the rotating head makes all the difference in this case. The Electric Knife Sharpeners are also very easy to use. Even a first timer can use the Electric Knife Sharpeners without much effort or instructions. This surely adds on to the utility factor of Electric Knife Sharpeners. They are a perfect solution for the commercial kitchen because the knife is used a lot and in such a case, it quickly loses its sharpness. In such a case, having an Electric Knife Sharpeners can quickly get your knives back in the kitchen. You can sharpen any type of knife with the help of the Electric Knife Sharpeners. This includes the waved and the serrated ones as well. This is something unachievable with the Manual Knife Sharpeners. The Electric Knife Sharpeners offers less control to the user and this is sometimes frustrating. They mostly work in automatic mode and if you are the person who wishes to have more control in your hand then the Electric Knife Sharpeners may disappoint you. The second disadvantage of having Electric Knife Sharpeners is the price. There is a huge variation in the price of the Electric Knife Sharpeners and the Manual Knife Sharpener. This was all about the Electric Knife Sharpeners and this should actually clear your confusion. If you are still not sure about which one to buy then refer to the conclusion listed below. We would certainly recommend you to go for the electric version as they are quick and easy to use. The results are also very consistent and you do not have to worry about damaging a knife while you are using the Electric Knife Sharpeners. You are going to incur a little cost while making the purchase but from the future perspective, this is also going to save a lot of cost for you as you can sharpen all types of the knife with help of the electric knife sharpener.